Back at the end of February, I published a post about the TV show Firefly - a space western that was tragically canceled before its time. As I mentioned in the post, the strength and loyalty of the show's fandom was such that Universal Studios green-lit a movie to continue the story, and that movie was called Serenity. In today's post, I'll take a look at that movie. Serenity picks up roughly where Firefly left off, but it's clear some time has passed. Inara and Book have both left the ship. The remaining crew members continue doing what they did in the series - taking jobs (legal or otherwise) where they can, trying to keep the ship afloat, and keeping Simon and River hidden from the Alliance. This last task will prove more difficult now, as the Alliance has tasked an agent known as The Operative with tracking down the Tams. Simon and River's fugitive status was weaved in and out of the stories in Firefly, but it takes center stage in Serenity. 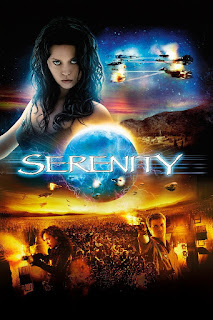 While Serenity is essentially a sequel to the Firefly series, it is in a somewhat awkward position. The filmmakers couldn't just take it as a given that everyone had seen the series, so it was necessary to present some backstory in a way that would catch newcomers up, but not be redundant to loyal Firefly fans. So what we get is a story within a flashback within a security recording. The story is an account of how humanity came to leave Earth and journey to the system of planets and moons in which Firefly and Serenity take place. This turns out to be part of a lecture that a teacher is giving to a classroom full of young students, including a young River Tam. As the lesson continues, we learn how the conflict between the Alliance and the Independents began. We'd gotten pieces of this story in various episodes of Firefly, but never as directly as we get it here. More than just introducing the fictional universe, there are aspects of these stories that end up being very important to the movie's central story thread. We then see that this class session is actually a flashback River is experiencing while she is being experimented on in an Alliance facility. This scene, in turn, shows us how Simon broke River out of said facility. As they escape, everything suddenly pauses, and we see that we have been watching security footage of the escape, which is being reviewed by the film's antagonist - the Operative. There is a minor difference in the characters from the series to the film. The first has to do with the main roster. Inara is not with the rest of the crew at the start of the movie, but that follows directly from the episode "Heart of Gold," where Inara tells Mal she is leaving the ship. But she is soon back in the mix as the film progresses. The change that seems harder to explain is Shepherd Book's relative absence. We know from the show that Book struggled with the moral situations he was put into as a passenger on Serenity, but it seems strange to me that he has such a minor role in this movie. There may be some behind-the-scenes reason why Ron Glass (the actor who portrays Shepherd Book) was not in as much of the movie as the TV show's other cast members, but I don't know why - from a storytelling perspective - Book couldn't have been more directly involved. On a side note, the advice Book gives to Mal about faith kind of bothers me. He calls Mal - who had turned away from his faith after the Battle of Serenity Valley - back to faith, but not necessarily faith in God. He tells Mal that it doesn't matter what he believes in, as long as he believes. This strikes me as an atheistic perspective on faith. From this perspective, objective truth is at worst nonexistent, and at best, irrelevant. Faith only matters in a subjective sense - in the sense that it positively impacts the believer psychologically. Obviously, as a Catholic, I fundamentally disagree with this perspective. Firefly saw a few different antagonists try to capture River (and Simon) Tam. The "Two By Two, Hands of Blue" agents were creepy and intimidating, but didn't have a lot of personality. Jubal Early had all kinds of personality, but he was a bounty hunter, so he didn't have the resources of the Alliance behind him. In Serenity, we get Chiwetel Ejiofor as a man known only as "the Operative." He is absolutely dedicated to the Alliance, and therefore will stop at nothing to make sure River is brought in before she shares secrets that could take apart everything the Alliance has built. Not only will he kill anyone in his way, but he will kill innocents to make sure the crew of Serenity has nowhere to hide. He believes that the Alliance will bring about a utopia, which justifies him doing terrible things to ensure it survives. Mr. Universe is a reclusive hacker-type that lives all alone (with his robot wife) on a moon surrounded by some kind of cloud of electricity. From here he gathers, records, and monitors media from all around the solar system. When I saw Serenity, I recognized Krumholtz as Charlie from the TV show Numb3rs. His Mr. Universe in this film has a quirky charisma, which quickly endeared him to me, even though he hadn't been in any episodes of Firefly. It's hard to talk about my favorite moments of Serenity without spoiling the movie, so consider this your SPOILER ALERT if you haven't seen the film yet. Click here to skip past this section. This might be the only time that a scene involving vomit makes it onto a list of my favorite moments in a movie. But I really like the scene on Miranda, after Mal and the crew discover the origin of the Reavers. River, who has been carrying this secret inside her, throws up immediately after. It's symbolic of her releasing a burden that's been eating her up inside. She no longer has to carry this bear this secret alone. I'm not even sure if she was aware that she knew it, or whether it was just messing her up on a subconscious level. But now she can breath free. Shortly after the scene described above, Mal and the crew need to make a choice. What do they do with the information they just learned? In an attempt to develop a drug that would essentially take people's free will away, the Alliance had accidentally created Reavers. Making this truth public would paint a big target on our heroes' backs. But, as Jayne points out (quoting Shepherd Book), "If you can't do something smart, do something right." If they let this go, it's only a matter of time before the Alliance tries something like this again, tries to play God. So, "no more runnin'," Mal says. "I aim to misbehave." "My turn. "While Mal tries to transmit the proof of the Alliance's wrongdoings to the 'Verse, the rest of the crew defends Serenity. During a strategic retreat, Kaylee is wounded, and Simon realizes he left his medical supplies in the room they just left. A room swarming with Reavers. As he stands up to go retrieve his bag, he is shot. River runs to him. "You've always taken care of me," she says tearfully. "My turn." She runs straight into the fray, diving through the door into the Reaver-infested room, tossing Simon's bag back through and sealing the door behind herself. The next time we see her, she is single-handedly laying waste to the Reavers, in the most beautifully choreographed action scene in the movie. My pick for this post, the movie Serenity, is sadly not available on Netflix at the time I'm writing this. You can rent it or buy it on Amazon, though, by following this link. Was the Forbidden Fruit a Set-Up?